Will Neuvirth be with them? The Washington Capitals clinched a playoff berth with their defeat of Southeast Division-leading Florida Thursday night. Where they'll be seeded remains to be seen. The win pulled the Capitals within two points of Florida for the division title with one game remaining this regular season. If the Caps can take the division, they'll have the third seed in the Eastern Conference and home ice for the first round, where they've been significantly better than on the road this season. They could also wind up with the eighth seed. Florida also clinched a postseason berth -- its first in 12 years -- thanks to Buffalo's 2-1 loss at Philadelphia, which eliminated the Sabres from contention. Jay Beagle, Alex Ovechkin and Brooks Laich each scored as Washington got ahead 3-0. Two Florida goals cut the lead to one, but Alex Semin provided one last score to give Washington a 4-2 win. 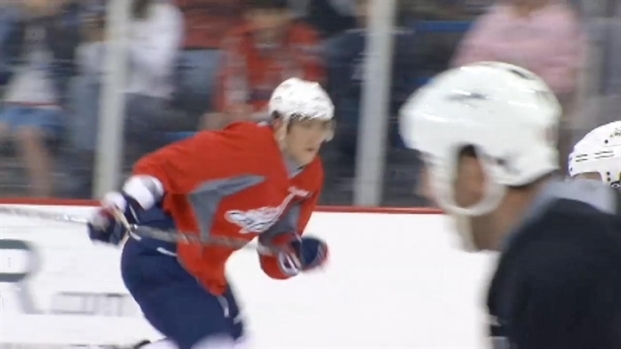 Heading in to the final two games of the season, the Washington Capitals are still fighting for a playoff spot, News4's Zachary Kiesch reports. While the team doesn't have to worry about making the postseason anymore, they do have to worry about goalie Michal Neuvirth, who went to the locker room with a leg injury and was replaced in the net by Braden Holtby. There's no word on the severity of the injury. The Caps close the season Saturday at the New York Rangers.